My full name is E**********. I was born on **********. My Membership Record Number is ***-****-****. So sad that noone in the Q12 will see this, read it, or respond in a likewise warm and loving manner. A beautifully written letter, poignant and heartfelt, with thoughts that more and more people who used to consider themselves members can identify with, written to a church that does not listen, or seemingly care. Thank you for your heartfelt thoughts, especially on the good things Mormonism brought into your life. When I left the Mormon church, I had hidden my emotions completely, denied my gay self, and I left in anger. It has taken two years of weekly therapy to come to love myself. Your resignation seems much more at peace than mine has been. However, I am grateful to be free of my emotional pain and the anger is subsiding as I learn to feel human emotions and deal with them. I love your thoughts here, Edward. I admire your integrity. Thank you for posting this beautiful resignation letter. I appreciate many of the points you have made as my experience and worldview are similar. Wishing you well on your life journey! You will be missed, we need you more than you need us, if there is any chance that as a church we can come to embrace LGBT community it won’t be through abandoning the community, but by remaining in it. But God understands… God bless. Wow, Mr. MacKay! While I’m sure you meant that comment in an encouraging and supportive manner. But as a gay, former Mormon, raised in “The Church”, I found your comment to be rather naïve. I’m assuming that you are not gay. Because I found your comment to be totally lacking in understanding of what an important and necessary step it is to leave a church that has no place for you. An organization that truthfully despises the person(s) that we are, as created by God. Leaving an organization like the LDS Church is one of the most important steps to living authentically as we are created by God. And to love ourselves, instead of hating the sinful, repugnant person our Church leaders have repeatedly told us that we are. (All of this I know from very painful, personal experience with my LDS Church leaders. And the recent Conference talks have proven that the Church leaders have not moved away from that position). Your last sentence however, did ring true and was appreciated. I understand how you feel about all the nice mormon things you felt given to you. For me they were cancelled out after 40 years TBM, but the lies and humiliating hatred mormonism espouses. But, it truly is a shame no leader will read your letter. Not one. Beautifully written. I appreciated how positive and loving your letter was. Thanks for sharing! This is absolutely beautiful. So much of my history with LD$, Inc. is the same. The only additional item I would have included, as a survivor of a good ward member, priesthood holder, and temple recommend holder.. who molested over 300 children, all hidden by the church. How the church treats wife abusers and pedophiles is the biggest reason I left. Wonderful letter, thanks so much for sharing and for being strong. There is a beautiful spirit in your soul. God sees it and cherishes it. There is a place for all of us in the eternities in his kingdom. God be with you till we meet again. This is an interesting perspective, but honestly the whole letter could have been shortened to this simple statement, “I am leaving the church because I don’t have a testimony.” Nothing he said really had any impact on his decision to leave except for this “I don’t believe institutions are true or false in an absolute sense.” The rest of the letter, no matter how well written, is a waste of time. Really? I mean, are you seriously saying that another human being taking the time write out his thoughts and feelings and reasons behind an obviously monumental life decision is “a waste of time”? What kind of heartless person are you, who would even think such a thing, much less publish it on said person’s own blog. Would you say that to the face of someone you cared about? Or might you consider that that would be kind of a jerk thing to say? Do you not realize there is a real, live human… a brother by your own belief system, behind every blog post? At any rate, you’re right about one thing. People who leave the churcn don’t have a “testimony” that mormonism is anymore “true” than any other church. If you were a young woman in the flds church, about to be married off as the 19th wife of some old dude, “losing your testimony” that Warren Jeffs is a real prophet would be considered a good thing. Ditto if you were caught up in a heavens gate-like cult. Likewise “mainstream” Mormonism. At any rate, you’re right about one thing. People who leave the church don’t have a “testimony” that mormonism is anymore “true” than any other church. If you were a young woman in the flds church, about to be married off as the 19th wife of some old dude, “losing your testimony” that Warren Jeffs is a real prophet would be considered a GOOD thing. Ditto if you were caught up in a heavens gate-like cult. One trait I’ve come to recognize that seems quite common in active Mormons is they feel authorized, and even compelled, to tell others how they should feel, think, and behave. They often even go so far to say why “we” do what we do — as if they have this God-given gift to know our minds. Of course the process is encouraged by church leaders in repeated statements like “they have sinned and lost the spirit;” or “they leave the church because they were offended, or want to sin…,” so they are parroting the leaders’ words. 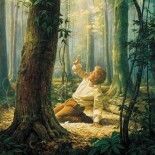 But at the core of Mormonism is a life paradigm that tells each member to seek their well-being from sources outside oneself. “Obey your leaders, pray to a deity that lives in heaven, seek advice on life choices by consulting your bishop,” etc.. They are never told “think about this, and if you conclude differently than the prophets say, you may be correct.” It’s a purely homogenizing culture — repeat rote phrases, prayers, temple ceremonies (over and over again)…all traits of cultish thinking. It is so freeing and empowering to transition to a point of internal locus…allowing yourself to believe what is in your head and heart, and not need another to validate your choices. That is a scary place to be when you are beginning this process, as we’ve grown up thinking that if we follow our own passions, it is selfish and wicked. But once there, the self-concept is amazing and powerful…and true, authentic living happens. Thank you for sharing this. My heart goes out to you. I too agree that our fold needs you and your many talents (one of which is clearly being a gifted writer). I wish that you could feel and see the love and empathy that so many of us (many of us in church leadership positions) feel for you. You are loved by so many, including a Savior whom I believe felt all our pain. I am grateful that you have found happiness and peace and appreciate the manner in which you do not criticize those of us who are happy in the church, and that does not mean happy without considering and questioning it’s teachings. I do think our role as leaders today is more about teaching children that they are loved and treasured by a ward family and also by a Saviour and Heavenly parents than anything else. I’m grateful my children at such an impression age are learning that and I’m grateful for the opportunity to share that with those under my care as well. Thanks for sharing your thoughts and again, sending you the very best. Not “whom” but “who.” Not “it’s” but “its.” Not “impression” but “impressionable.” Those quibbles aside, I like your post very much. This is perhaps the most eloquent and gracious letter of resignation I have ever read. Truly a model for departing an organization on any level. I am inspired by the honest discussion of your values and your support of equality for all members. I am most thankful for your acknowledgement without shame of the importance of healthy sexuality as normal and beautiful. Thank you for articulating so honorably the problems I have had with Mormon Church practices and seeming hypocrisy for decades without denigrating its’ followers.. I haven’t left yet, but your example is one of compassion, kindness, and courage. I’m still feeling angry at the deceptive practices of the church and sorrow for raising my children in a church that has done so much harm. I admire your ability to see so much good in the midst of the negative. This entry was posted on May 11, 2015 by EdwardJ.